Already have Online Banking? You can send us a secure message using Online Banking to request a change. Just go to Messages and click on New Conversation. If you are uncertain of your password or would like to change your password, there are multiple ways to do it. If you are unable to access your Online Banking and would like to reset your password, you can enter your login id and click on the Forgot Your Password? link below the field asking for your password. The system will prompt you to select a delivery point for a Secure Access Code. Once you receive and enter the Secure Access Code you will be able to reset your password. To change your password within Online Banking, go to Settings > Security Preferences and select Change Password. You will need to enter your current password, your new password and confirm the new password by re-entering it on the last field. For security reasons, your account is locked after three attempts to login with an incorrect password. Your account remains Locked for 1 hour before allowing you to try to login again. To unlock your account prior to the 1 hour, please contact our Customer Support Department at (603) 352-1822. SBW gives you the same account management experience on your desktop, tablet, or smartphone. You can perform the same tasks on your chosen device, and you do not need to learn a new way to work on each platform. Experience all the features available in Online Banking on your mobile device. The SBW Mobile App also has offers additional features like Mobile Deposit, Touch ID/Fringerprint Login, and Passcode Login. Ready to Go Mobile? Download the SBW App! This feature allows SBW customers to use biometrics at the point of login with the use of Touch ID /Fingerprint instead of a login ID and password on eligible Apple iOS and Android devices. This feature is only available for users who have a Touch ID enabled Android device, iPhone or iPad and have registered their device. If you disable the Touch ID/Fingerprint feature on your device, you will be required to use the standard login method with your login ID and password. To enable Touch ID/Fingerprint login start by opening the SBW App. Tap on the Touch ID button if you are on an iOS device. If you are on an Android device this button will say Fingerprint. Review the terms and tap on Enroll Now. Enter your Login ID and Password and tap on Authorize. Place your registered fingerprint on your device fingerprint reader. Mobile Deposit is designed to allow SBW customers to make deposits to their SBW checking and savings accounts from their camera enabled mobile device. Mobile Deposit is a Free service for all Internet Banking users. Both Retail and Business customers have access to this feature within the SBW Mobile App. To Enroll login to the SBW Mobile App and go to Settings > Mobile Deposit Enrollment. Review the disclosure and agree to the terms. Once you complete the enrollment go to Transactions > Mobile Deposit. You may need to log off and login again to see this option enabled. To view your deposit activity and deposit status go to Transactions > Activity Center. Once a deposit is made, you will see an option to view Deposited Checks. You will see a list of deposits with the check image and deposit status. Mobile Deposit funds are made available on the next business day. *Mobile Deposit Limits are subject to change. 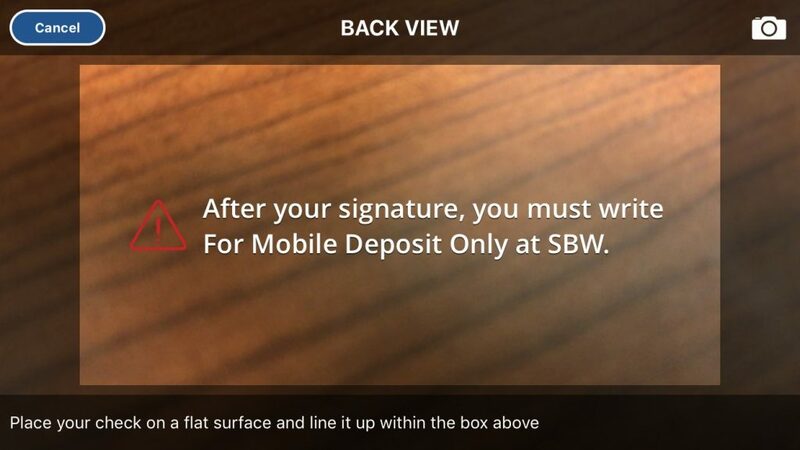 All checks you deposit using SBW’s FREE Mobile Deposit feature will need to have “For mobile deposit only at SBW” written below the signature on the back of the check. In addition to having the ability to change your password within Settings > Security Preferences you can also change your Login ID and update where you can receive a Secure Access Code. When you login to Internet Banking you will see a list of all your accounts. Accounts on which you are primary and joint owner on will be automatically linked to your Internet Banking. To Learn more about the features on the home page go to our Online Banking Help Guide. You can send our Customer Support Department a secure message in Online Banking or the SBW mobile banking app. In the Navigation menu, click or tap Messages. The Messages page appears. Click or tap New Conversation. The New Conversation window appears. Click or tap a Recipient from the With drop-down list. When your message is complete, click or tap Send. Your new message appears on the Conversations page. Online Banking Transfers within SBW accounts are processed in real time. Transfers initiated after 9:00 PM between SBW accounts will have an effective date of the next business day. Electronic Transfers to an external account may take up to 3 business days to complete. In the Navigation menu, click or tap Transactions > Funds Transfer. The Funds Transfers page appears. (Optional) Select the Make this a recurring transaction check box. The Schedule Recurring Transfer fields expand. Click or tap a transaction frequency. To cancel a transfer (recurring or future dated) go to the Activity Center search for the transfer you would like to modify and click on Actions. You can link an SBW checking or savings account as a “Deposit Only” account for immediate transfers. You do not need to be a signer on the account you want to add as a Deposit Only account. You will have the ability to transfer funds to this account but you will not have balance information. Pay several bills at once or make one-time payments. You can also view your pending and recent payments. Receive some of your bills electronically. We can receive electronic bills from hundreds of billers nationwide. Set-up automatic payments to pay your electronic bills or to automatically schedule payments of a set amount at regular intervals. If you are paying a company, you will need your latest bill with billing account number, billing address, and phone number. If you are paying an individual, you will need their name, address, and phone number. After you add the company or person to pay, the payee will appear within the Bill Pay Menu. Note: Remember to keep your bill information updated. If the name, address, phone number, or account number changes, click on the Options link and click on Visit Bill Pay Site. There you can make the appropriate updates to ensure that the bill information is correct. The Bill Payment system completes a search of each biller you add to see if they are available to receive electronic payments. If the biller is available to receive electronic payments the Bill Payment system will send the payment electronically, usually within three business days. If the biller is not available to receive electronic payments, the Bill Payment system will generate a check and send the check in the mail. If we send the payment by check, it can take 7 business days for the biller to receive it. However, the estimated time of arrival may vary based on the postal service. If the payment is sent electronically, the money for the payment is withdrawn from your payment account on the pay date. If the company or person cannot receive electronic payments, Savings Bank of Walpole Bill Pay prints a check and sends it to the billing address. For payments processed as a check, the money is withdrawn when the company or person deposits (or cashes) the check. eBill is a feature that allows you to receive and pay electronic summary versions of paper bills directly from your Bill Pay account. To enable eBills go to Bill Pay and click on the Options link and Visit Bill Pay Site. Person to Person Payments allows you to add an individual as a payee and send them funds via email or phone. To use P2P you will need to go to Transactions > Bill Pay. Within the Bill Pay page you will need to go to Options and Visit Bill Pay Site. There you will need to Add a Payee to Pay an individual. Submit a “written” stop payment request to the bank by entering information in each required field. Start within the Services Menu and select Stop Payment. To place a stop on a single check, select Single Check. If you would like to stop payment on a series of checks, select Multiple Checks. If you submit your stop payment request from within Online Banking, your request is considered a written request. The stop payment request shall remain in effect for six months or until written notice is received from you to revoke the stop payment order, whichever occurs first. You may renew the request when the six month period has expired by submitting a new stop payment request order. You will incur stop payment charges as disclosed in the current fee schedule for the applicable account. To request the ability to make transfers between your account at another financial institution and SBW you will need to submit a request. To get started go to the Services Menu and click on the Add External Account. Savings Bank of Walpole is unable to guarantee the date a transfer from your external account will be complete. However, depending on the date and the time of day of your request, it should be complete in 3 bank business days. The deposit amounts should be entered in cents (example: $0.05 should be entered as “05”). In the Navigation menu, click or tap Settings > Text Banking. The Text Enrollment page appears. Under SMS/Text tap on the On/Off button to turn this account On for Text Banking. To get started with texting, simply start a text message and send it to 226563 (BANKME). BAL <account nickname> Displays the current accoutn balance for the account that you specify. HIST <account nickname> Displays the recent history for the account that you specify. XFER <from account nickname><to account nickname><amount> Transfers the amount that you specify from one account to another. HELP Displays a list of contact points for information about text banking. Caution: When you send or receive a Tet Banking message, normal text message and data rates apply. Step Six: Go back to the menu and click on Statements.eStatements are provided in PDF format. In order to confirm that you can read files in this format, you will need to click on Get Code and enter the code to Verify. If you are signed up for eStatements or receive paper statements and have misplaced a statement this is where you can find them. Go to Services and select Statement Stuffers to get a copy of the statement stuffers sent with your statement. A new page will open. One of the items you can always find as part of your statement stuffer is a balancing sheet- a form provided to help you balance your bank statement. Use our automated phone system, TellerPhone, to get account information 24/7 and make transfers over the phone. Just call (603) 925-7653.